The seventh day was sanctified by God in the beginning (Gen. 2:3), was kept by Israel and Gentiles to the end of the Bible, and was to be obeyed as a sign and perpetual covenant. Ecclesiastical history proves that early Christians kept Saturday as the Sabbath. When James J. Strang translated the Book of the Law of the Lord from ancient plates taken from those given to Moses, the people were commanded to keep the seventh day of the week. When the Book of the Law was translated, those following James J. Strang were once again bound by the original law. 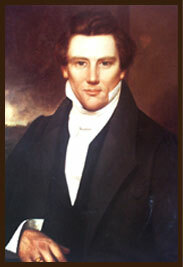 By God teaching “line upon line, and precept upon precept,” those–like Brigham Young–who did not follow James were left to observe, “the venerable day of the sun.” Only those who followed James J. Strang received the Book of the Law and the renewed commandment to keep the original Sabbath– the seventh day, Saturday! “Remember the Sabbath day, to keep it holy. Six days shalt thou labour, and do all thy work, but the seventh day is the Sabbath of the Lord thy God.” (Book of the Law, p. 22) James J. Strang wrote in his notes, “1. The day of rest originated in the rest of God, when he ceased the work of creation, at the making of man, to have dominion over the earth. “2. It was had in remembrance as an institution of God, before promulgated by his voice in Sinai; (Gen. ii, 2, 3. Ex. xvi, 23;) and there is no ground for believing that the sanctifying of the Sabbath, was not a law among the Patriarchs and the Antediluvians, because it is not mentioned in the scriptures; for from the time of Moses until that of Solomon, when it was unquestionably in force, it is nowhere mentioned. “3. Throughout Christendom, with some slight exceptions, the first day, and not the seventh, is kept as a Sabbath. For this they have no warrant in the scriptures, and pretend to none. (Bucks Th. Dic. ‘Sabbath.’) The reason given for the change, is, that Christ raised from the dead the first day, and the attempt is to justify it by tradition, and the practice of the Church. “4. But, evidently, the Church have no power to change or abrogate a commandment of God, who required us to keep the seventh day, not any other day in the seven. “5. The early Christians did undoubtedly frequently meet on the first day for religious worship, precisely as the Saints do nowadays, in exclusively Christian communities; not because they regarded it as the Sabbath of God, but because on that day, being the regular day of heathen festivals, men would come together to hear them. “6. Keeping the first day as a Sabbath, instead of the seventh, is one of the innovations forced upon Christianity by the Emperour Constantine, to make the change of national religion less difficult. “7. The very language of this Commandment, seems to presage the propensity of man to change the Sabbath; remember the Sabbath day; and God, foreseeing what wicked men would do, has placed on his chosen a special injunction that they keep that day in all their generations for a perpetual covenant; (Ex. xxxi, 13-17;) and awful penalties are denounced against those who abolish it. The law of God on keeping the Sabbath was given for a thousand generations. “9 Know therefore that the LORD thy God, he is God, the faithful God, which keepeth covenant and mercy with them that love him and keep his commandments to a thousand generations…11 Thou shalt therefore keep the commandments, and the statutes, and the judgments, which I command thee this day, to do them.” (Deut. 7) Only under special Gentile dispensations were the people permitted to observe, for a short time, Sunday. 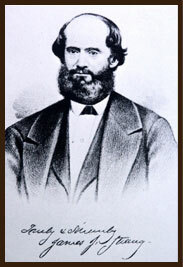 James J. Strang was the only successor of Joseph Smith to abide in this law of God.